Over the past decades I have created countless maps for Dungeons and Dragons. 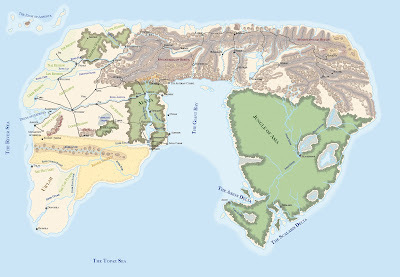 At first I simply created maps on paper but as the digital age expanded I started using Paint, and then Campaign Cartographer, and now I'm using Gimp. Photoshop is also a perfectly good program to use, but in my case it has always been a program I've had to pay for, and I've therefore never gotten around to learning to use it. This first map was created in Campaign Cartographer. Originally, I had created an assortment of islands for a D&D 3.5 game but when the players turned evil they wanted to raise the land to create a single island. I allowed this and drew a map on paper first, and since then I've created this map to illustrate the lands that they conquered since that fateful day when they raised it from the bottom of the sea. Note that the names are a mixture of Elvish and names that the players gave the various places. Only The Tower of Magic and Dun are names from the original map. This next map was also created in Campaign Cartographer. It was the map I created for my first D&D 4e game. I took a map of Mars (near Terra Cimmeria) and then I started modifying it. Once complete, I made the central part of the map the human lands with the Points of Light from the Dungeon Masters Guide, and added a few extra names, including names from Mars. I then added various other nations, such as the dwarven mountains of Dawnforge, the elven forest of Winterbole, the halfling jungle of Harken, the ruined empire of Ma'adim, and the goliath lands of Chronium. The last map I sent was created in Gimp and inspired by maps I have of Faerun from Forgotten Realms. Although I mainly play 5e now, I have a 3.5 game running, and this is the map that the players will play on from June and forth. It is the last vestige of life in the world. The game takes place at the end of the 3rd Age, and the players will fight in an Elemental War against forces of chaos and temporal magic. This map will eventually change over time. It is currently the map I'm most proud of, and I look forward to using it, and modifying it as the war progresses.